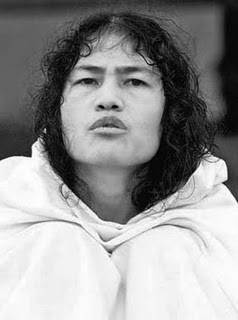 Irom Chanu Sharmila, an activist, journalist and poet from Manipur has been on hunger strike since 2 November 2000. She demands that the Indian Government repeal the Armed Forces (special powers) Act (AFSPA). Which she blames for violence in Manipur and other parts of India’s northeast. Having refused food and water for more than ten years, she has been called "the world's longest hunger striker". Her primary demand to the Indian government was the repeal of the AFSPA, which allowed soldiers to indefinitely detain any Manipurian citizen on suspicion of being a rebel. Three days after she began her strike, she was arrested by the police and charged with an "attempt to commit suicide", which is unlawful under section 309 of the Indian Panel code, and was later transferred to judicial custody. Since then, Irom Sharmila has been regularly released and re-arrested every year since under IPC section 309, a person who "attempts to commit suicide" is punishable "with simple imprisonment for a term which may extend to one year. On October 2, 2006, for around four months, Irom Chanu Sharmila went to Raj Ghat, New Delhi, which she said was "to pay floral tribute to my idol, Mahatma Gandhi." Later that evening, Sharmila headed for Jantar Mantar for a protest demonstration where she was joined by students, human rights activists and other concerned citizens. On 6 October, she was re-arrested by the Delhi police for attempting suicide and was taken to the All India Institute of Medical Sciences, where she wrote letters to the Prime Minister, President, and Home Minister. At this time, she met and won the support of Nobel-laureate Shirin Ebadi, the Nobel Laureate and human rights activist, who promised to take up Sharmila's cause at the United Nations Human Rights Council. Irom Chanu Sharmila also known as the "Iron Lady of Manipur"